Why assign a price to a spacecraft in, say, 2237? Whatever it costs will be quoted in rupees, florins, or some new unit, and the raw figure wouldn't mean a thing to us if we knew it. Which is just the point. We want to know how much a spaceship costs in context - how many people can afford a ticket, how many schools can be built for the cost of a gigawatt laser star. In this ongoing discussion we're considering a recognizable future economy and technology. No Singularity, and not enough time for society to have evolved out of recognition. Perhaps the Industrial Revolution will reach maturity, in which further refinements are gradual. The first decades of aviation had Moore's Law style progress, but jetliners have had much the same performance and appearance for the last 50 years. A lot of low hanging fruit has already been picked. In any case, we're dealing with a fairly recognizable future economy and technology, able to do a lot of things we can't, but doing many familiar things in familiar ways. In 2237, long distance air transport (the only kind likely to be common) will probably be at high subsonic speeds, in jetliners that mostly just look and fly like jetliners. They may have nanomaterial strips instead of flap actuators, but only geeks would notice. Spacecraft will also be broadly recognizable, because we already build them. We've built many small robotic ones, and are starting to build big ones. The International Space Station is not unlike the forward end of an interplanetary ship, minus the main drive with its big propellant tanks and radiator fins or solar wings. The ISS has a 'dry' mass - structure and equipment, minus all consumables - of 304 tons, about 10 percent more than the super jumbo Airbus A380 (277 tons). They are also roughly the same size, in overall dimensions (both having 'wings') and in bulk, with pressurized volume about 1200 cubic meters. The ISS has a crew of six as an exploratory craft, and about a third of the volume is living space, so if configured as a transport, so to speak, it might carry 20. An improved and mature technology will surely improve on the ISS, but the most desirable improvement, better toilets aside, is making it cheaper. 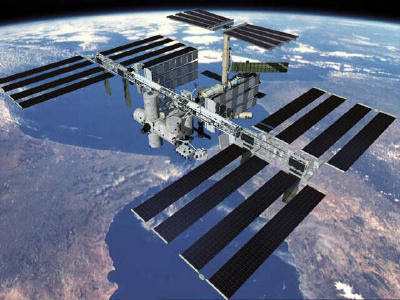 The ISS has cost something like $50 billion, about $170 million per ton. This is too much. We can't be getting around in spaceships that cost $50 billion just for the forward section, minus the parts that scoot it around. As a comparison, the slightly smaller Airbus A380 can be yours for about $325 million, depending on options, or about $1.2 million per ton. 747 variants are comparably priced. In the broadest structural engineering sense they are all similar constructions: lightweight pressure tanks and trusses (e.g. wing spars), fitted with complex, lightweight equipment and electronics. So what accounts for the difference in cost? The notorious Washington 'iron triangle' bears a share of the blame, from outright fraud to shameless overcharging, to subcontracting work out into 400 congressional districts. Throw in policy changes that can throw out years of design work. Also the ISS is a prototype, in a fact a sort of meta-prototype. Skylab and Mir were caravels; the ISS is our first try at a galleon. The builders not only had to handbuild it, which makes any prototype costly; they had to work out all the design requirements. My rule of thumb is that a prototype costs about 10 times as much to build as a production item. It doesn't take too much squint to imagine that a comprehensive development program costs 10 times as much as handbuilding the prototype. Which pretty much gets you to the price differential between an Airbus A380 and the ISS. A bit of bad news is that building satellites is an established, mature industry, and they also cost on order of $100 million per ton dry mass. One reason is a launch cost to LEO of $10 million/ton, with most satellites going to higher orbits, a strong motivation to cut weight to the extreme. Satellites squeeze a lot of sophisticated gadgetry into a very small mass. They are equivalent to the most expensive parts of a large spacecraft, minus the (relatively) cheaper large tanks and structures. I think it is highly optimistic, given that it is a 100 to 1 cost reduction over current space practice. A lot of people think it is very conservative. A million a ton - $1000 per kilogram, $450/lb - is pricey, and it makes really big spacecraft horribly expensive, like the $50 billion laser star I outlined for Ferrell. Modern naval ships cost only a tenth as much, ton for ton (carriers even less). But naval ships use thousands of tons of cheap shipbuilding steel. Lightweight materials are used extensively in superstructures, but the hull, where most of the mass is, is built of good old steel, and everything on all decks is massively braced against the heave of the sea. Seagoing ships are very strong, but they are not lightweight. There is a loose analogy here to laptop versus desktop computers; it costs more to pack power into a lightweight container. Spacecraft don't need to be compact, and crew cabins and propellant tanks are inherently bulky, but they do need to be as lightly built as practical. This naturally pushes up cost per mass: you're hanging the expensive parts on a much lighter (and thus more expensive) chassis. And after all, the cost of jetliners hasn't kept jet travel from becoming pervasive. For the adventure minded, third-hand deep space ships will in time be available for far less than their original sticker price, perhaps $10 million for Serenity. Progress in space has been and will be slow, because up front costs are enormous, tens of billions, even hundreds of billions over a couple of decades, say to establish the first base on Mars. But it we do it at all, eventually someone will come up with the DC-3 of deep space, or more likely a combination of basic drive, support, and habitat pods that can be configured to a variety of missions and turned out in production runs of scores, eventually hundreds. Models might be in production for 50 years and in service for a hundred years, still serving outposts that don't rate modern ships. When they are finally gone they'll be remembered as the ships that opened up space. Related link: On my old website I wrote about (FTL) interstellar trade. 1) much of the space architecture and materials involved, and extreme expense of uber-tight designing (reduce volume and mass as much as possible) are driven by our current need to build planetside, and then deploy up through 1 gee and 1 std atmosphere. While a space-based industrial sector will not make nonsense of these limitations (for all sorts of reasons), I think we can expect the pitiless and brutal design efficiencies (and concomitant expenses) to diminish significantly. Perhaps not a whole additional order of magnitude, but possibly by a factor of 2-5. And at that rate, you start approaching HULL costs for wet navy vessels. Now, when it comes to powerplants, life support, etc.--you are still going to have the godawful expense of 24/7 100% take-it-with-you power and lifesupport. They're always going to be the priciest creations in humanity's golfbag of tech toys. Yes, the current need to launch through gravity and atmosphere, and atop very expensive boosters, forces pretty extreme designs on spacecraft. I don't think hull/structure costs will fall to wet navy levels simply because the construction will remain a lot lighter - mass is a direct propulsion penalty. But they can be at least as cheap as airframes, arguably somewhat cheaper because of less purely structural demands. But you are right that power and life support will remain the big cost drivers. The hab structure is probably the cheapest major part of the hab module, the real money going into all the life support plumbing. Just an adition: Affordable travel by Jet owes not only to improvements in technology but also thanks to a general increase in wealth (which in a sense is related to tecnological progress). So air travel is today affordable, because most people produce more wealth than twenty years ago. This is the reason why i wouldn´t reject the posibility that supersonic passenger jets may become something common in the future (you only need to maket time more valuable, in other words you make more money working during those hours than what you save using a subsonic jet). This would also be an important reason of why space travel becomes affordable: not only because it gets cheaper, but also because whe become wealthier and are able to afford it. Interesting piece. Launching from earth makes the mass penalty very severe; I'd guess this is part of the reason why some of the sci-fi I've read (not a large sample) features industrial manufacture in space. "We want to know how much a spaceship costs in context - how many people can afford a ticket, how many schools can be built for the cost of a gigawatt laser star." Yes. It doesn't really matter if you say the ship costs one million of the yankee dollars per ton or fifty thousand Afro-Caribbean kopecs per ton. For the purposes of fiction what we really want is the ratio between starship costs and Jim-Bob's salary at the rocket manufacturing plant (Where he oversees the wet-nano tanks that churn out long-chain diamondoid fibres for the casing spinner). By triangulating between that ratio, the drive thrust and endurance slected, and the type of authority that backs the early drive into space, you can learn a lot about the author's politics. That ratio determines whether we have individualistic Belters flitting about in ultralight one-cabin mining ships, or massive ore refineries like the Nostromo from Alien (A ship owned by a company with so little concern for the wellbeing of its personnel that it didn't even provide them with lifeboats or evac pods). Carla - That's one of the reasons, although SF writers tend to skip over the hard parts of feeding all these people and supplying them with air and water (It's a bit like the historical fictions and fantasy novels that ignore just how many farmers it takes to feed one mounted warrior, have happy well-fed peasants eating chicken every day). The other reasons boil down to getting as many people into space as possible for the story background, and a leftover from the highly optimistic ideas of the Sixties and Seventies (Jerry Pournelle's A Step Further Out and G. Harry Stine's The Space Enterrpise are available cheap in used book stores, if you really want a taste of that optimism). "A bit of bad news is that building satellites is an established, mature industry, and they also cost on order of $100 million per ton dry mass. One reason is a launch cost to LEO of $10 million/ton, with most satellites going to higher orbits, a strong motivation to cut weight to the extreme." Another reason is that there's no routine maintenance on these things. How much would an airplane cost if you could only repair the engines or electronics during flight? Carla - Yes, lift cost from Earth is a big reason to make stuff in space. But there is an odd little paradox involved. Launch cost has to come down (by at least 90 percent) to make large scale human space travel likely at all. And once launch cost is reduced, it may be cheaper to haul stuff up than to build a whole new industrial infrastructure in deep space. qwert and Ian - Your points are closely related. The figure we are really most concerned with is the price of a ticket, and (not unrelated) the cost of a year's food and rent on a living cubicle, relative to incomes on Earth. These costs are what determine how many people go, or are sent. Long term economic trends: The 'market basket' of available goods has grown enormously, of course, but there are long term reference points like the price of food staples relative to average incomes. Over the industrial revolution as a whole, productivity, real incomes, and living standards have increased by about 3x per century. But since about 1973, real incomes for 80 percent of 'Murricans have been pretty stagnant; income growth has been almost entirely in the upper fifth. Which relates to qwert's point, because those are the people who fly regularly, and they are flying more as their incomes grow. I personally think this is a sign that the Industrial Revolution is entering its mature phase. And to some degree there is a law of diminishing returns for economic growth itself. Once an economy can comfortably feed, cloth, house, and medically tend to its population, further economic growth essentially goes to buying toys. The US reached this level around mid 20th century; Western Europe a few years later, then the East Asian tigers, and now India and China have achieved it for about half a billion people, though another billion and a half remain in third world = essentially pre-indusrial conditions. If we don't fork it up, the planet will be mostly 'developed' by 2100, with traditional mass rural poverty mostly a thing of the past. Poor regions will be comparable to poor regions of the EU. On the other hand, the cheap oil ride is clearly over. To do the above we will have to do it with sustainable techs, not cheap. And we will have to deal, politically and socially, with the reality that most of the world's people live fairly modest material lives and do mostly grunt work. Probably there will be an economic oligarchy. No one believes in old fashioned 1900 era socialism any more; the modern era left is about constraining capitalism, not abolishing it. Some restraint will be needed, because it is already clear that we are basically running a life support system and have limited margin to screw it up. Space, to be honest, falls in the broad class of toys. Earth's basic economic and ecological problems have to be more or less solved in this century, before space will be a big factor, even if powersats end up handling several percent of global power load. And no foreseeable deep space tech is going to transform life on Earth the way orbital tech already has - materially, hardly at all, but enormously in how we communicate, including this blog. But we will do space anyway, because we can, and because a sustainable planet can afford $100 billion/year or so to do Cool Stuff in space, some of which may lead to profitable byproducts. I think Virgin Galactic is going to be monitored very closely by everyone. Their ticket price is rather steep still, at $200,000 per passenger. Yet, if you look at that price tag again, $200,000 for a human-sized and human-massed object tossed in a sub-orbital flight is quite an improvement over previous attempts. And this is the price for a real first-generation privately-owned space ship. The current mass estimates (the real numbers are still classified) puts maximum payload at 13 tonnes metric, and the mass of the ship itself at around 10. There will be a maximum of 6 passengers (and since it would be silly to even send it up with fewer, say 6 tickets at 200,000. That 1.2 mil to send 23 tonnes. That's $50,000/tonne! This assumes that 6 passengers plus life support plus fuel plus 2 pilots etc... will mass-out the ship, which it probably won't. Let's assume rather then that we double that cost and put it at $100,000 per tonne. Granted this is for a sub-orbital hop, but this is a rather impressive figure, especially considering this is a first generation commercial vessel. So far Virgin has displayed a high-risk investment business model. They are willing to take more risks than most companies. They have also been rather successful with it. If they prove to be a successful commercial venture, why not SpaceShipThree that does go into LEO, for far cheaper than anyone else is currently doing it? Even the idea of SpaceShipTwo has revitalized SSTO projects. If SS2 demonstrates successfully that putting things into orbit without going through gold-plated government systems and the additional costs that come with them, and have already been highlighted above, then other companies might well follow. Yes, space remains expensive, but it is still very early in the space age, and not all low-lying fruits have been picked. Rick: "But since about 1973, real incomes for 80 percent of 'Murricans have been pretty stagnant; income growth has been almost entirely in the upper fifth." Well, I don´t think this means necesarily that economic growth in the future will be slower. I suspect the main reason for this stagnation can be found in globalization: suddenly millions of people can compete for most unskilled or low-skilled jobs in the global market. Of course this means that the ratio of skilled workers for every inhabitant in the global economy has been reduced, increasing the upper salaries. The effect on develping countries is however drastic, millions are leaving poverty. If you use a broad definition of middle class, then somewhat over 50% of world population is now middle class. What i want to say, is that economic growth hasn´t stagnated, in fact it is now happening faster than at any other time in human history. Although cheap oil may be finishing, I don´t think it´s going to be the end of prosperity, it wouldn´t be the first resource that disapears. I imagine space comercialization to continue and private enterprise will probably be the most important in earth orbit. I imagine this will also lead to massive reduction in costs, not necesarily related to technological progress but also thanks to the introduction of new commercial and industrial practices. (Ford didn´t need any revolutionary technology to set the world on wheels, just inovative use of current technologies, which in a sense could be considered as a new technology). But as Rick said: I simply don´t see any commercial aplication for deep space acces (other than tourism for those capable of paying it). Not even resources which may be completely depleted on Earth may be valuable enough to just find a substitute. So i agree that deep space is in some sence going to be a "luxury", only left to goverment and (maybe) as an entertainment. Land. They don't make it any more. Humans, like viruses, expand to fill their environment. Land is the resource that we can't find a replacement for. Meanwhile human population is growing exponentially. So exploration of space has two possibilities. One is to find additional habitable space for our growing population. The other is to have an orbiting laserstar killing off the population and thus freeing up more land. Zero-g Manufacturing: can't do that on Earth. Rare Earths: Iridium, Osmium, etc are right now *very* expensive, 400$ a troy ounce, because they are very rare. The theory is they "sunk" because of their high density back when the crust was molten. Asteroids, if we extrapolate from the Iridium-reach KT boundary, might be very rich in those expensive but useful materials. He3: Possibly a critical fuel if fusion becomes actually possible as a source of power. Only present in Lunar regolite and gas giants, so if we want to have some, we have to go get it. Solar power: There are projects to orbit large-scale solar panels that would bean down power through microwave. While some of those reasons don't really require us to leave orbit, they would require a very large infrastructure in orbit. Once that infrastructure is there anyway, it becomes cheaper, and easier to justify, further development. woops. Iridium and Osmium are of course not Rare Earths. I meant to make a list and that colon sort of slipped out. Lifting stuff into space basically means imbuing it with potential energy. That is expensive to begin with. However, if you want it to keep that potential energy indefinitely, it needs to be in orbit, which means even MORE energy to get the kinetic energy up there. I suspect it takes less energy to go orbit to orbit from the asteroid belt to Earth than it takes to go from stationary ground on Earth to Earth orbit. There is still a time factor and life support. But both of those can be conquered by robotics. That just leaves the issue of manufacturing stuff in space. Virgin Galactic is a brilliant idea, and Burt Rutan is a design genius. But they have not really upended space economics, just made it work in an unexpected way. Basically they are building passenger counterparts of the X-15. Way impressive, but vastly less demanding than reaching orbit. I suspect they'll find SpaceShipThree a tougher nut than they thought. Earth surface to LEO is uniquely difficult, the bottleneck of the whole thing. Deep space missions do not require extreme vehicles. Aircraft style structural fabrication will do fine. But orbit lift imposes extreme requirements in mass ratio, and for the orbiter stage at least, heat load. Judging from SpaceShipOne/Two, I bet that Rutan will go the opposite direction from SSTO, and have at least two and maybe three stages to orbit. That way each stage can be less extreme. Having said all this, I think that orbit cost could reasonably be brought to 10 percent of its current level, through streamlining of operation and economies of scale. We already have one large space industry, satellites, which has shown little to no interest in launch improvements, because launch cost is only a modest fraction of their overall costs. They hire truckers; they don't invest in improved trucks. Sending humans into space, like deep space travel, may remain in the class of 'toys' for a long time to come, because even zero gee manufacturing would probably be automated rather than have to add a life support system. Really the greatest economic challenge is bootstrapping, because we mostly won't know what profitable things we can do in space until we go up there and try them out. This is why I think the public sector will have to lead the way for the most part. There are few known profit possibilities, so it will take nonprofit R&D to find and identify all the others. Citizen Joe - You are correct. Practically any deep space mission takes less energy than getting from the surface to LEO, let alone geosynch. Fast deep space travel does take more energy, but only milligee acceleration, so while the energy requirement goes up, the power requirement does not. Rick I do agree on your points. However, before the robotic mass manufacturing micro-gee plants there will have to be manned prototyping and testing facilities to refine those techniques, in dedicated facilities not just in scientific outposts like the ISS. Since those types of facilities will also be easier to keep clean-room purity, I would not be surprised for future computer technologies to be developed in space. Notably micro-g crystal growth for quantum computing in space-borne clean rooms. Really, the key to a real presence in space is going to be profitability. So while sending things to orbit is expensive, we've already proven there are profitable reasons to go in space. The profusion of commercial satellites proves that even at today's high to-orbit costs, the returns completely justify them. I don't think it will be a huge step to justify a permanent commercial manned presence in space thanks to micro-g manufacturing. It might cost a lot to set up, but if this type of manufacturing can give corporations a technological edge, then the profits will justify it. Rick, :"Why assign a price to a spacecraft in, say, 2237? Whatever it costs will be quoted in rupees, florins, or some new unit, and the raw figure wouldn't mean a thing to us if we knew it. Which is just the point. We want to know how much a spaceship costs in context - how many people can afford a ticket, how many schools can be built for the cost of a gigawatt laser star." Perhaps you could use man-hours of labor to equate the future cost of things (like spacecraft), to current costs...use the median of peoples' wages per hour (throw out the top and bottom ten percent of the populations' wages), and average the remaining 80%. That way, you can relate how much something costs (at any period in time) by how many, or what fraction of a, this averaged-man-hour-of-labor (AMHoL) it takes to pay for it. The one thing that I haven't heard, so far, is the fact that a small number of people will want to get away from their home culture, for whatever reason, and will do anything to get as far away from home as possible, by any means. If that means emigrating to Mars or Titan, then so be it. Granted, hystorically such colonies are rare, but not unheard of. Yes, I agree that somewhen in the future, we may see space manufacturing, space-based solar power, space based research, and other activities. However for most of them you don´t need to leave earth orbit. Even if orbit to orbit travel is cheap, why incur the cost if you don´t need it. And cost go out of control if you want to put a crew onboard. With the exception of mining for space manufacturing (no idea if this could be practical, i simply don´t see massive large-scale manufacturing in space, and if sizes are small, cost of sending those materials to factory if you already have to send things you can find only on earth like plastics), I simply don´t see any activity that couldn´t be done on orbit. I also don´t see fusion reactors being practical if their fuel has to be shipped from the moon in large quantities. And if you need more land: Wouldn´t it be cheaper to expand over the oceans, to the underground or building skyscrappers? Last point first, there's really no 'land' in space, at least not in the Solar System, because to be meaningful as real estate land has to be habitable. There are people who will move to the moons of Jupiter if they can, just to get away, but a deep space infrastructure has to exist first - no Pilgrims without a Mayflower. But it is not really necessary for space activity to be financially profitable - in the overall space picture so far, the for-profit satellite industry has been a payload, so to speak, not a booster. Obviously the military gave the big initial push, but most of what we have accomplished since the 1960s has been due to the civilian public sector. This may remain the case through much of this century, until additional space industries develop to significant maturity. Ferrell - Equivalent man hours is indeed the best 'real' measure of cost - I use present day dollars because they're an easy, familiar reference point. If average US income is $50,000 for 2000 hours/year (a guess, but can't be terribly off), the average wage is $25/hour, and jet planes cost about 40,000 work hours/ton. Cost of living in labour-hours is a major part of the calculation. If it takes 1800 hours/year at average wages to survive, then private ownership of that jet-plane equivalent (JPE) is a huge luxury. Even a ticket to ride it is a huge expenditure. If it only takes 1400 hours/year to survive at that same job, then members of the middle class can buy time-shares in our JPE. A high-income/high cost of living society sounds like a contradiction, but it's a pretty good description of Victorian society and its heating and food costs. It may be a good general description of any technically advanced society with high transportation costs or a small resource base. A fair proxy for labor hours is the price of staples, which is more or less the basis on which long term inflation tables are calculated. In the 19th century the trend of money prices was flat to down; disinflation rather than inflation was the rule. Hence the pervasiveness of debt as a social issue, as in the traditional melodrama about the farm mortgage. Current launch costs, ~$10,000 / lb, might someday decline to $500 / lb (in current day dollars) if we are able to fully realize the efficiencies promised by several radical launch techniques (laser launch, electromagnetic launch, ram accelerator, etc). However, we can't expect prices to ever get cheaper than that without resorting to something like a space elevator. The only way to make the mentioned space launch concepts cheaper would be to send materials (from space infrastructure) into LEO for use. You still need to determine where the optimal delta V sweet spot is, figure out what you can produce with your space industry, etc. I think the main reason we failed to really open up the space frontier is that nobody really adressed the Gravity Problem:In a modern Rocket 90% of Fuel is used for the first few hundred Kilometers. However traveling beyond LEO is nearly effortless. Space Elevator. with cheap access to orbit the the construction of Pure Orbit-to-Orbit Spacecraft in the likes of Discovery One or the ISV Venture Star will be relativly cheap, probably ca. 500 Million for the eqivalent of an 747 IN SPACE!!! Working Stiffs in SPAAACE !! !